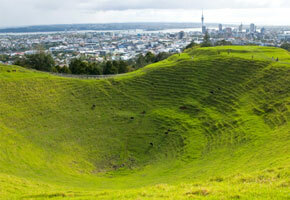 Auckland is New Zealand's largest city and is situated on the country's North Island. This coastal location allows for breathtaking scenery and beautiful beaches all year round , and is perfect to explore with a campervan rental. Use the quote box above to pick your dates and vehicle type to start your search for the perfect campervan. There are plenty of high quality motorhome supplier brands to choose from out of Auckland with it being a major tourist attraction and holiday hot spot. To make sure you are making the right choice with your Auckland campervan rental, check out our campervan supplier compare page here. Please read on to find out about what makes Auckland the perfect starting point for your New Zealand motorhome holiday, if you need any more information please contact our reservations team on (NZ) 0800 003 002 or (AU) 1800 704 332. Nestled between two harbours, 11 extinct volcanoes and numerous islands in the Hauraki Gulf, it truly is a wonderful and unique place to visit. Earning the nickname 'City of Sails' is not surprising; due to the local's passion for spending time on the crystal clear water. 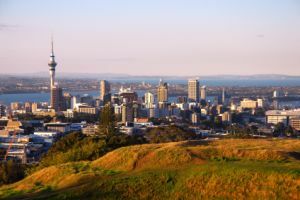 Auckland's surrounding hills are blanketed green with lush rainforest and where the water meets the land, a multitude of beaches. Auckland city and surrounds offers an endless array of attractions including museums, galleries, the zoo, bungy jumping, bridge climbing, family amusement parks and a myriad of café's alongside beautiful urban beaches. Perhaps you would prefer to take a scenic route to the outskirts of Auckland for some bushwalking or picnics? The best part of travelling in campervan is the freedom. You choose! Hauraki Gulf and Islands are some of Auckland's most talked about highlights. Each island has its own distinctive and unique character, which is essentially what makes them so special. The island's can be accessed via ferries from Auckland, making ideal day trips. If you are after a seaside escape of a different kind, why not head to the pristine Coromandel Peninsula? Coromandel is home to natural beauty, misty rainforests and long, golden beaches, making it the ultimate holiday destination for locals and tourists alike! Its location within an hour and a half of the major centres of Auckland and Hamilton means that you can pick up your campervan rental from Auckland and then easily start your exploration. So start planning your Auckland motorhome holiday today and fill out the quote box above to compare campervan prices. If you have any queries please feel free to visit our FAQ's page or contact us directly to chat.